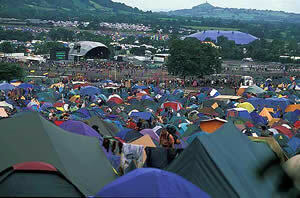 Glastonbury is one of the largest music and arts festivals in the world. 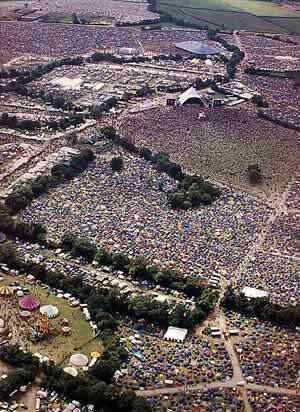 112,000 people come for a long weekend of camping, music, crafts and that unique festival atmosphere. OK, so Shrii Shrii Anandamurti never came to Glastonbury(! ), but the festival is an ideal opportunity to reach out with our social, cultural and spiritual treasures - the very spirit of Baba's Mystical Tour. In 2004, for the first time in over 25 years of the festival, we will have our very own Ananda Marga tent in the "Healing Fields" - an area of the site hosting spiritual and ecological groups. Every day we will run a programme of spiritual workshops, collective kiirtan, meditation and yoga posture classes, offering all the festival-goers the chance to experience the joy and upliftment of these practices. We'll be fundraising for events throughout the tour. There will be music and theatre performances, a roaming yogi on stilts and the mouth-watering, vegetarian, Yoga Mela Café - sure to bring an alternative flavour to the world-famous festival. 22nd June - Arrive in London and then to Glastonbury town to stay the night. 23rd June - Enter the festival early in the morning and start setting up. The majority of festival-goers will arrive that day. 25th-27th June - The main performances and events at the festival take place. 1. Tickets for the festival have sold out - you will need one to get in. 2. The flight to the Netherlands is not included in your tour booking fee.